In Scotland trainspotting is popular. This makes you wonder about the popularity of semi spotting in Australia. How long do you have to wait at a road crossing? 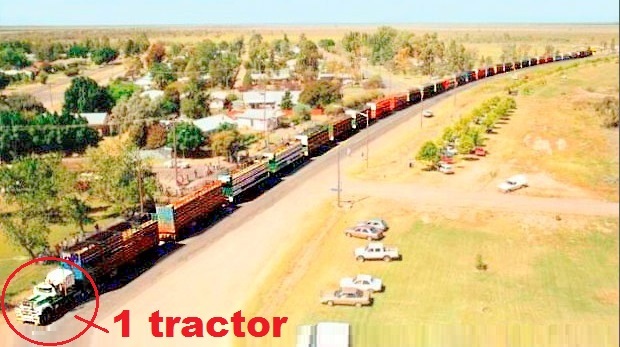 Australian Road-Trains is what these are called. They are the longest trucks in the world. Most of them: They have 3 or more trailers on the back of the tractor and are 53 meters long (174 feet). They haul 115 metric tons (253, 531 pounds). Others, the stand-out ones: 7 trailers and haul 190 metric tons. These are long tractor-trailer rigs. More like tractor-trailer-trailer-trailers?! Are they driven by owner-operator -operator-operator-operators? 1…2….3…. not gonna make you count, but don’t ruin it for the other readers who want to try to guess! This record-holding truck was in front of 29 trailers. Guys, if you have more photos of these things, please share them on the Facebook post! Next Article Road Train of Semi Trucks!